July 17th was chosen as the date when, in 1897, two tons of gold arrived in Seattle from the Yukon on the steamship Portland. A mile-long parade featuring fifteen floats and countless civic and musical groups followed. In the evening, the Potlatch King, E.L. Webster of the Arctic Club, and his Queen, Daphne, reigned at a ball featuring a fantastic fireworks display. Over the festival’s week-long span, activities took place all over the city. Its multi-cultural make-up was reflected in a parade of all nations, a Japanese lanterns festival, and a Chinese Dragon parade. The newspapers mentioned that “imported Indians” attended the festivities too, adding further exoticism to contemporary notions of native traditions (ironically, at the time that Seattle’s elite appropriated the potlatch for their own purposes, the native peoples of the US and Canada were legally prohibited from practicing the tradition). Indian canoe races were held on Lake Union, while speedboat races took place on Lake Washington. There were demonstrations of swimming and diving at Lake Union, and track events downtown. Spectators enjoyed demos of motor craft, biplanes, and even early hydro-planes. Flights and landings were made by the Curtiss aviators on Elliott Bay three times daily. There was something for everyone. read more at the PI. 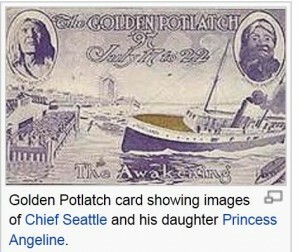 Read About The Seattle Yacht Club’s Potlach .. in Red Face! Posted 17 Jul 2018 by theaveeditor in Misc. ← Where is the pilot?